Carry your hydration pack in comfort and securely with the Condor Water Hydration Carrier. The Condor Water Hydration Carrier is designed to securely carry a 2.5L Hydration Bladder (included), and keeps it secure and reduces movement and shifting while you run and maneuver. Loaded up with MOLLE, you can easily add additional pouches and packs onto your Condor Water Hydration Carrier. 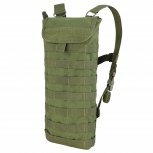 The Condor Water Hydration Carrier can be worn as a traditional backpack, or remove the shoulder straps and you can use the MOLLE straps to attach it to your own combat vest. Very comfortable light.very versatile with the Molle webbing. The velcro tabs on the inside, securing the bladder weakened in mater of months. Apart from the tabs, this is a great hydration carrier.